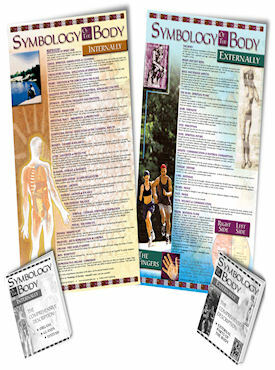 Excellent companion set for the “Disease Symbology Handbook” includes 2 full-color laminated charts for quick and easy reference to the symbology of Internal and External body parts plus 2 bonus pocket reference booklets containing detailed and comprehensive descriptions. Michael Schwartz is an author, lecturer and holistic nutritional consultant. He was educated in the workings of the mind as it relates to the creation of one’s own personal physical reality. With the understandings of the Universal Principles in hand, Michael was able to change the course of his life, which led to many different benefits and experiences, including the foundation of his company, Michael’s® Naturopathic Programs. He entered the health food industry in 1975 and, in the ensuing years, he discovered his talent for herbal and nutritional healing. This led him to establish a naturopathic practice and, after many years of assisting clients to regain their health on multiple levels, such as physical, material, social, spiritual and emotional, his supplement company was formed in 1984. Michael has published books, including “Disease Symbology Handbook”, “Dream Symbology Dictionary”, and his latest work “The Naturopathic Healing Handbook”, as well as articles for numerous wellness magazines and journals. Host of a mind-body radio program, Michael is also involved in educating the public on holistic wellness through radio and television appearances. He is a highly respected lecturer, with appearances at doctor and pharmacist conferences, colleges and universities, and health and wellness venues nationwide. Michael’s holistic nutritional consultations continue to benefit people from all walks of life, including world class athletes and elite performers. Autoimmune Diseases: Why You Have An Immune System! Join Michael Schwartz LIVE on the Spiritual Naturopathy radio show every Monday at 2pm CT. Call 888-558-6489 with your questions during the live broadcast. Click the image below to listen. Copyright © 2019 Michael Schwartz. All Rights Reserved.